I got a little overzealous this past weekend and baked up a storm. It all started with an innocent question to co-workers on Thursday afternoon. “Do you guys usually bring in treats for Valentine’s Day?” I said I was thinking about baking something for my husband for Valentine’s Day and I would make a little extra to take to work if everyone was bringing something. In that conversation, one co-worker said she wanted to try one of the “breads or muffins or pastries” that I can eat – the stuff I’m always talking about. Her sister has celiac and sometimes buys “unappealing” gluten-free bread, but doesn’t make her own baked goods because it seems too difficult. That night, I went home and flipped through recipes I might like to make over the weekend. On Friday, I had the idea to make something out of almonds, something out of cashews, something out of pecans, and something out of coconut flour so they could experience the differences. I had also been wanting to try a Fruit Pudding recipe from Elana’s Pantry. And I had really been wanting to make Elana’s Cranberry Orange Biscotti again – I LOVE that stuff. So I assembled an ambitious list of items to make Saturday and Sunday. My excitement was a little bigger than my energy, but I did end up making 5 different things. I had also come up with a list of 20 people to whom I wanted to give treats. How was I going to make enough of each item to share with 20 people?? I would have to do smaller items… mini versions, if you will. I needed mini muffin pans!! So most of Saturday was spent on a quest for inexpensive mini muffin pans. This was after going to buy produce from Chad at Oasis Cafe, beef at Market on State, and checking out Caputo’s. Sadly, I didn’t get much actual baking done on Saturday. These treats follow the guidelines of the Specific Carbohydrate Diet (SCD). There is no grain, soy, potato, refined sugar, yeast, peanuts, or dairy (including butter) in any of the treats. There is honey, eggs, and nuts. I did not meet my goal of having something made out of coconut flour, but I did get almond, cashew, and pecan. And two of the items had no eggs, in case someone was concerned about that. While searching for the mini muffin pans, I found those cute heart bags at Dollar Tree. (I was hoping to find heart themed paper liners there, but no luck.) 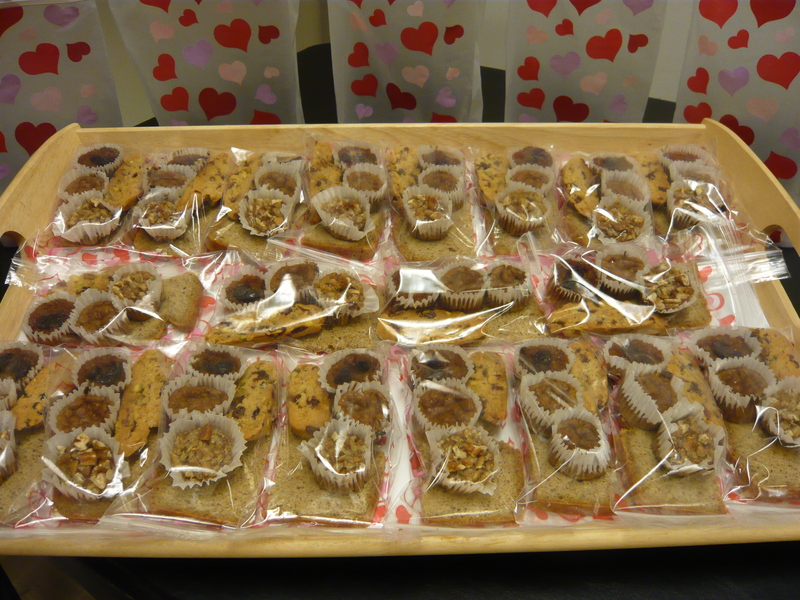 I made 25 treat bags, and after giving away the first 10, I learned that you cannot put biscotti in the same plastic bag as “moist” goodies. So I removed the biscotti from the other 15 and re-crisped them before giving those out. Fun! Cranberry Bars – Not pictured. I completely forgot to take a picture of these. They did not turn out like the picture on Elana’s web site. Her photo shows a nice crust and looks like you can easily pick up each square. Mine was very “wet”. You couldn’t even see the crust when looking at a slice from the side. They were delicious, but not as portable as I was expecting. The ingredients are pecans, dates, grapeseed oil, sea salt, fresh/frozen cranberries, honey, orange zest. I use honey 1 for 1 in place of agave in her recipe. Pumpkin muffins – These have two raisins on top. The ingredients are raw (soaked) cashews, pumpkin, egg, honey, baking soda, cinnamon, nutmeg, ginger, real vanilla extract, flame raisins (on top). I modified Zoe’s recipe, which is modified from one in Breaking the Vicious Cycle by Elaine Gottschall. Cranberry Orange Biscotti. The ingredients are blanched almond flour, sea salt, baking soda, honey, orange zest, dried cranberries (sweetened with apple juice, not sugar), roasted unsalted pistachios. I do not use the arrowroot powder and I use honey 1 for 1 in place of agave. Fruit pudding – These are the other two little round things – one has pecans on top and one is plain. The ingredients are dried apricots, prunes, cinnamon, sea salt, water, eggs, real vanilla extract, pecans (only on top). 1/2 slice of “dark bread”. The ingredients are roasted unsalted almond butter, fresh pumpkin, grapeseed oil, baking soda, apple cider vinegar, eggs, sea salt.